Standard edition is an affordable option for small and medium-sized organizations. It includes the core functionality needed for non-mission-critical e-commerce, data warehousing, and line-of-business solutions. For instance, all of the XML features present in Enterprise Edition are also included in Standard Edition. Similarly, components that other database vendors charge for as separate add-on products for their highest-end editions are included in Standard Edition. Business today demands a different kind of database solution. Performance, scalability, and reliability are essential, and time to market is critical. 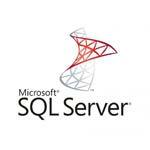 Beyond these core enterprise qualities, SQL Server provides agility to your data management and analysis, allowing your organization to adapt quickly and gracefully to derive competitive advantage in a fast-changing environment. From data management and analysis perspectives, it is critical to turn raw data into business intelligence and take full advantage of the opportunities presented by the Web. A complete database and data analysis package, SQL Server opens the door to the rapid development of a new generation of enterprise-class business applications that can give your company a critical competitive advantage.